Inquisitiveness, curiosity and willingness to learn: our Elder Friends lack none of these qualities. What they don’t have is an intuitive knowledge of this omnipresent technology. They need a helping hand to get started. 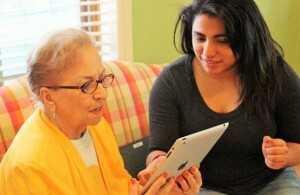 Through Little Brothers’ Surfing Together program, seniors can learn how to connect to the Internet via an iPad. Plus, for people who feel shy or intimidated around the elderly, this activity is the ideal icebreaker. 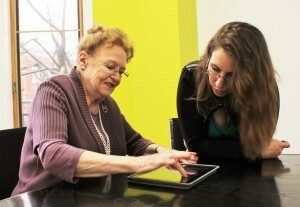 Armed with an activity guide (in French) and a tablet, volunteers visit with Elder Friends in the comfort of their home and show them the “e-ropes.” The accompanying conversations are guaranteed to be vibrant and engaging. What could be more heartwarming than introducing an Elder Friend to a world of endless music (YouTube) and limitless exploration (Google Earth), giving them the ability to create art at their fingertips and providing them with a tool for keeping their mind active? 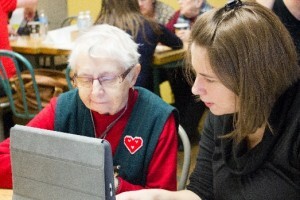 This program was created in conjunction with the Université du Québec à Montréal (UQAM) research chair on aging and population diversity and the UNESCO–Bell Chair in Communication and International Development , also based at UQAM. Initial implementation was carried out during an awareness activity held at the university. A report on e-inclusion and the role of digital tablets in improving seniors’ social relationships is currently in the works. We have noticed that our Elder Friends’ learning curves are less steep than we thought. The user-friendliness of this particular technology is quick to win them over – so much so that many of them who have given it a whirl say that they hope to repeat the experience in the not-too-distant future. Lack of hardware: The iPad, activity guide and applications come included. Lack of convenient access: We go to our Elder Friend’s home and take everything to them. We are looking for volunteers who are interested in taking part in this exciting, innovative project to use new technology to make social isolation and digital exclusion of seniors a thing of the past. Tools and support provided. Fun times and rewarding moments guaranteed! Requirements: Candidates must be comfortable using tablets and applications and able to impart their knowledge to an Elder Friend at their own pace. IF YOU WISH TO VOLUNTEER FOR THIS PROGRAM, COMPLETE THE ONLINE VOLUNTEER APPLICATION and be sure to tick the “Surfing Together” box.